Commercial Refrigeration Equipment Market size is set to exceed USD 35 billion by 2024; according to a new research report by Global Market Insights, Inc. The shipments are predicted to grow at around 1.5% CAGR from 2018 to 2024. Growing consumption of meat and meat products is expected to propel the commercial refrigeration equipment market growth over the forecast timespan. According to the World Health Organization, the annual meat production is expected to increase to 376 million tons by 2030. Rising food prices are propelling the consumers to opt for cheaper options such as frozen meat. The poultry production & export from Latin America is increasing rapidly, driving the commercial refrigeration equipment market growth. Urbanization is one of the key factors in the growth of the commercial refrigeration equipment market. Urbanization and increasing disposable income of the consumers are encouraging them to switch to healthier diets, thus compelling them to consume more frozen fruits & vegetables. Also, urbanization has improved the infrastructure, such as cold storages, aiding the trade of perishable foods. The key trend in the commercial refrigeration equipment market is the development of energy-efficient equipment to reduce the energy consumption. These devices are designed for operations that require maintaining specific temperatures despite the frequent door openings. Governing bodies such as Energy Star are developing standards to develop energy-efficient models. These models consist of components such as condenser fan motors, ECM evaporators, and high-efficiency compressors to reduce the energy consumption and utility bills. The replacement of the traditional devices with the energy-efficient and technologically-advanced devices is taking place at a very slow pace due to large capital investments required. The high cost of these devices is discouraging small establishments such as local markets and grocery stores with budgetary constraints in adopting advanced refrigerators, restraining the commercial refrigeration equipment market growth. 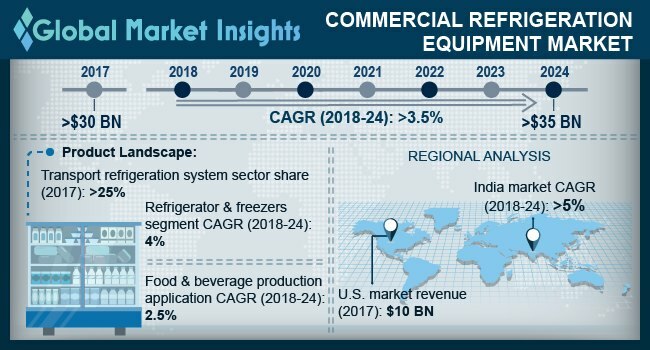 The beverage refrigeration equipment market, which was valued at over USD 3.5 billion in 2017, is expected to be driven by the increased beverage consumption. Increased availability of a variety of refreshment drinks and increased consumer preference toward health drinks, such as juices and yogurt drinks, are aiding the industry growth. The demand for alcoholic beverages is increasing rapidly among the millennials. According to the National Institute for Health & Welfare, the retail consumption of alcohol constitutes about 70% of the total alcohol consumption. The commercial refrigeration equipment market in retail applications will grow to over 4 million units by 2024 due to the increasing adoption of beverage refrigerators and display cases in supermarkets, grocery stores, and bakery stores. With the increasing penetration of supermarket chains across the globe, the popularity of centralized and multiplex refrigerators is increasing rapidly. Governing bodies, such as the Environmental Protection Agency, are offering incentives to develop technologically-advanced products to improve the energy efficiency. The Europe commercial refrigeration equipment market is characterized by the increasing trade of perishable products such as milk & milk products, fruits, and flowers. According to the International Flower Trade Association, the export of cut flowers from Europe, particularly from France and the Netherlands, is increasing rapidly, propelling the demand for the transportation refrigeration equipment in the region. Key players in the industry include Dover Corporation, Daikin Industries, Carrier Corporation, Whirlpool Corporation, Electrolux, EdgeStar, and Haier Corporation. The industry is characterized by the intense competition among the players and the vendors are increasingly investing in developing energy-efficient and environmentally-friendly products. The supermarkets and retail chains are increasingly adopting the equipment certified by ENERGY STAR that offers approximately 40% energy savings. This is encouraging the manufacturers to developed energy star certified products.